Kokusaku Seikō K.K. (国策精工㈱, meaning National Precision Industries Co., Ltd.) was a Japanese camera maker. 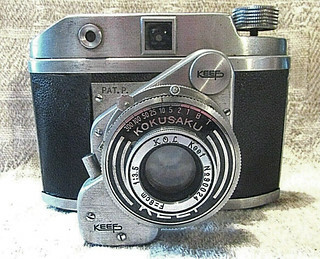 It made the Auto Keef 4×4 coupled-rangefinder camera from late 1940 or early 1941, and perhaps also the Semi Keef 4.5×6 camera. It also made Kokusaku leaf shutters. The Auto Keef was equipped with K.O.L. lenses supplied by Kajiro Kōgaku. After this company became Gojō Kōki Seisakusho and perhaps opened a new plant, it is said that Kokusaku took over the older plant and brand names in late 1941. Some advertisements mention both company names "K.O.L. Gojō Kōki Seisakusho" and "Kokusaku Seikō K.K." together, and the relation between the two companies is not yet clearly understood. The April 1943 government inquiry on camera production says that the company was called Tōa Kokusaku Seikō K.K. (東亜国策精工㈱), and gives the address as Ikuno-ku Tsuruhashi Ikuno-chō 1–141 in Osaka (大阪市生野区鶴橋生野町1–141). The document attributes some K.O.L. lenses to Gojō (五城), others to Tōa Kokusaku (abbreviated 東亜国) and others to Kokusaku (国策), with no apparent logic. The U Hitonar 75mm f/3.5 three-element lens (three elements) is also attributed to Kokusaku, and it is probable that the Hitonar 75mm f/3.5 and 75mm f/4.5 were made by the Kokusaku company too. An advertisement dated February 1944 gives the address of Kokusaku Seikō K.K. as Yodobashi Shimo-ochiai 2–875 in Tokyo (東京・淀橋・下落合二ノ八七五), very close to that of Gojō. All the K.O.L. and related lenses are described in the page about Kajiro Kōgaku. ↑ Inoue, p.132 of Kurashikku Kamera Senka no.14. ↑ Advertisement reproduced in Inoue, p.132 of Kurashikku Kamera Senka no.14, and in Hagiya, p.179 of Sekai no Raika renzu; advertisement on p.6 of Nihon Shashin Kōgyō Tsūshin, February 15, 1944, reproduced on p.70 of Hyaku-gō goto jūkai no kiroku. ↑ Advertisement on p.6 of Nihon Shashin Kōgyō Tsūshin, February 15, 1944, reproduced on p.70 of Hyaku-gō goto jūkai no kiroku. Nihon Shashin Kōgyō Tsūshin (日本写真興業通信). Hyaku-gō goto jūkai no kiroku (百号ごと十回の記録, Ten records, every hundred issues). Tokyo: Nihon Shashin Kōgyō Tsūshin Sha (日本写真興業通信社), 1967. No ISBN number. Advertisement on p.64, corresponding to the second cover of the February 15, 1944 issue. This page was last edited on 20 February 2019, at 03:51.